Every customer we work with is unique when it comes to their recycling and recovery needs. For this reason, we work closely with each customer to develop a customized recycling program that may include purchase options, logistics, and handling services. 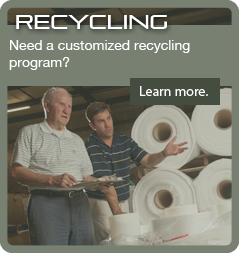 By listening to our customers and understanding their goals, we can develop a recycling program specific to their needs. Purchase of Plastic Materials: We determine the fair market value of your plastic materials. Collection: We evaluate what types of materials you have, which materials are recyclable, how they are manufactured, and what is the best method for collecting the materials to be recycled. Tracking/Reporting: We provide online access to custom reports through our PRITS system, giving our customers an easier way to manage their recycling program.